Olympus has announced its new OM-D E-M1 interchangeable lens camera, which is now the flagship of its Micro Four Thirds lineup. Rather than calling it the follow-up to the E-M5, Olympus says that the E-M1 is actually the 'successor' to the E-5, a Four Thirds DSLR introduced back in 2010. The E-M1's 16.3-megapixel Live MOS sensor has on-chip phase detection, which promises to focus legacy Four Thirds lenses (using the optional MMF-3 adapter) at much faster speeds than previous Olympus m4/3 cameras. Other interesting features include the E-M1's large electronic viewfinder, which has a magnification of 1.48X, a touch-enabled LCD, a rugged body that is water, dust, and freezeproof, and an impressive number of customizable buttons. Wi-Fi is also included. 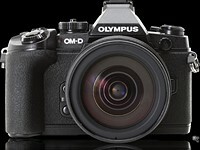 The OM-D EM-1 will be available in October in a body-only configuration for $1399.99 / £1299.99. Buyers in the UK can get the HLD-7 battery grip if they pre-order the camera before launch, plus the MMF-3 Four Thirds adapter if they purchase the E-M1 by the end of November. CENTER VALLEY, Pa., September 10, 2013 – In response to the demand for a compact system camera as powerful as a professional DSLR, Olympus introduces the OM-D E-M1®, its new premium flagship camera and worthy Micro Four Thirds successor to the Olympus E-5 DSLR. The E-M1 has a revolutionary design for advanced photographers looking for a high-performance tool in a compact system camera package. The powerful E-M1 is packed with incredible speed and image quality that rivals full-frame DSLRs, in a portable yet lightweight body designed to go anywhere. The Olympus OM-D E-M1 now works seamlessly with all ZUIKO Digital lenses, in addition to working with M.ZUIKO Digital lenses, so photographers can enjoy optimum performance of the entire Olympus lens lineup. This is possible due to advanced DUAL FAST AF system that combines both Contrast AF and On-Chip Phase Detection AF. DSLR users familiar with an optical viewfinder will marvel at its electronic viewfinder (EVF) that is as large as a full-frame DSLR viewfinder and has added creative control. Its ergonomic body provides easy access to all manual controls and is ready for action in the most difficult shooting conditions. Olympus also announces today the development of two new high-performance lenses, establishing the M.ZUIKO PRO lens category. The ZUIKO Digital ED 12–40mm f2.8 PRO lens (24–80mm, 35mm equivalent) and the ZUIKO Digital ED 40–150mm f2.8 PRO (80–300mm, 35mm equivalent) will expand the imaging options for professionals and serious photo enthusiasts alike. With the OM-D E-M1, experience the highest image quality of any Olympus camera through the combination of a new 16.3 megapixel Live MOS sensor, a new TruePic VII image processor, and its best-in-class M.ZUIKO lenses. The TruePic VII image processor reduces noise and color fading at high ISOs for improved image reproduction. New Fine Detail Processing II technology configures the appropriate sharpness processing for each individual lens for natural, high-quality resolution, as well as reducing compression artifacts when recording movies. The newly developed DUAL FAST AF selects the ideal method, depending on lens type and settings: either 37-point On-Chip Phase Detection AF or 81-point Contrast Detection AF to maximize the performance of both ZUIKO and M.ZUIKO lenses. Both systems work together to significantly improve continuous autofocus tracking performance when a Micro Four Thirds lens is attached and C-AF is selected. Users can select Group Target AF for a variety of situations, Small Target AF for pinpoint shooting, or Super Spot AF for capturing even smaller subjects and specifying a small area focus location during macro shooting. The TruePic VII engine supports 10 frames-per-second shooting with a 41-picture RAW buffer in single autofocus (S-AF) mode and 6.5 frames-per-second shooting with a 50-picture RAW buffer in continuous autofocus (C-AF) mode. The E-M1’s advanced, built-in Interactive Electronic Viewfinder features a 1.48x (35mm equivalent of .74x) magnification factor that rivals full-frame DSLR cameras. The extremely high-resolution 2.36 million-dot LCD panel provides a large, clear image that is on a par with optical viewfinders. Tracking moving subjects is completely natural, with a display time lag of only 0.029 seconds. Users can experiment with aspect ratio, magnification, color, and highlight and shadow, and the effects of camera settings on subjects are viewable prior to capturing the finished image. Adaptive Brightness Control raises the brightness when shooting in bright outdoor conditions and lowers the brightness in dark indoor conditions, reducing visual errors from light and dark adaptation of the eye. Color Creator is a new easy-to-use tool that fine-tunes hue and color saturation using the intuitive GUI and Live View screen, so users can create original images imbued with their own choice of colors. Creative Color was created with a designer's sensitivity in mind, and hue can be adjusted in 30 steps, and color saturation adjusted in eight steps, including the baseline. 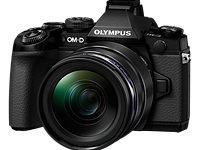 The Olympus E-M1’s built-in 5-Axis Image Stabilization with Multi-Motion IS mechanism reduces the effects of camera motion and image blur from five directions. Whether shooting stills or HD video, even the motion blur caused by walking or running is stabilized. New algorithms make image stabilization more effective at low shutter speeds. When it is employed while panning during still image shooting or movie recording, IS-AUTO mode automatically detects the camera's movements and provides optimal correction regardless of direction or camera orientation – even when panning in a diagonal direction. Users can check the image stabilization effects on the Live View screen as well as the viewfinder to accurately frame and focus, even during telephoto or macro shooting. Multi-Motion IS, used in combination with the 5-Axis Image Stabilization mechanism, produces excellent correction during movie recording. The Olympus OM-D E-M1 expands the dustproof and splashproof capabilities of the E-M5 even further with freezeproof capabilities — guaranteed operation down to 14 ºF — for the best environmental resistance of any Olympus interchangeable lens camera. Its durable magnesium alloy body, and weather-resistant seals and gaskets block moisture and dust for use in any environment, without sacrificing image quality. The camera’s Supersonic Wave Filter (SSWF) dust reduction system vibrates at a super-high speed of more than 30,000 times per second to powerfully remove dust particles so users can shoot in dusty environments. Advanced photographers will appreciate the intuitive 2x2 Dial Control system to easily adjust four often-used functions with the camera’s lever or two dials: aperture/shutter speed, exposure compensation, ISO speed and white balance. A built-in grip similar to that of the E-M5 makes shooting with Four Thirds lenses more comfortable, and all frequently accessed buttons are logically laid out. Controls are now more functional: the settings reset function is activated by pressing and holding the OK button and there is a toggle option for the My Settings shortcut and a locking mode dial to prevent unintentional movement of the mode dial during shooting or when removing the camera from a case or bag. The dedicated “mic-in” jack supports an external microphone when recording HD movies and a built-in X-Sync socket easily connects to studio strobes. 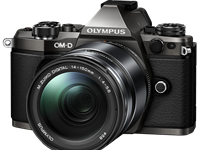 The Olympus OM-D E-M1 includes built-in Wi-Fi, and the set-up is simple. By quickly scanning the QR code displayed on the camera's LCD with a smart device, it syncs with the Wi-Fi network created by the camera. The free Olympus Image Share 2.0 smartphone app synchronizes a user’s smartphone and E-M1 so the camera’s “Live View” is effectively displayed on the phone, and the camera can be controlled by touching the smartphone display as if it were the camera. This is ideal for taking self-portraits, capturing images of wildlife from a distance and sharing images easily online. 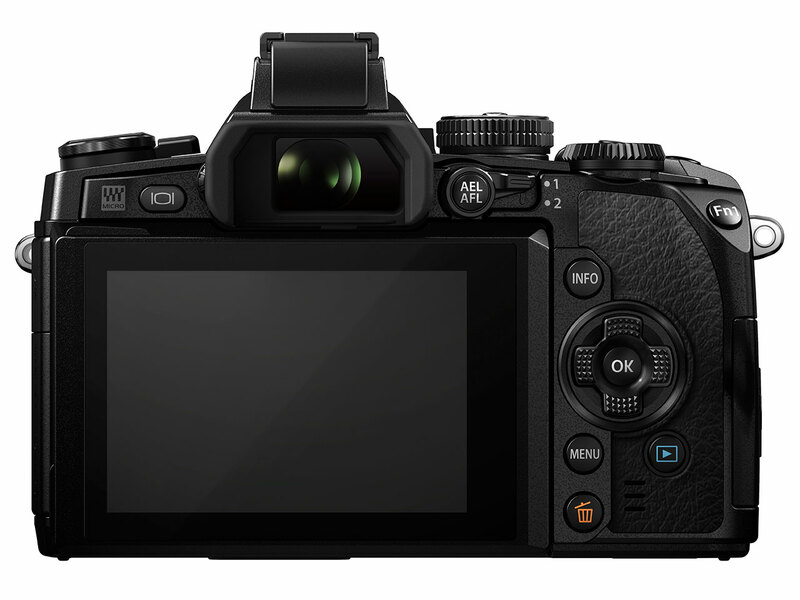 The E-M1’s remote shooting function has been improved for use in all main shooting modes (P, A, S, M and iAUTO). Users can now wirelessly adjust various settings, such as the shutter speed, aperture value, ISO and exposure compensation, as well as operate the Live Bulb shooting mode from their Wi-Fi devices. They can also use their smartphone to embed GPS information into their images. New Diorama II adds to the popular range of Olympus in-camera Art Filters and offers left and right blur effect in addition to the top and bottom blur effect of Diorama I. 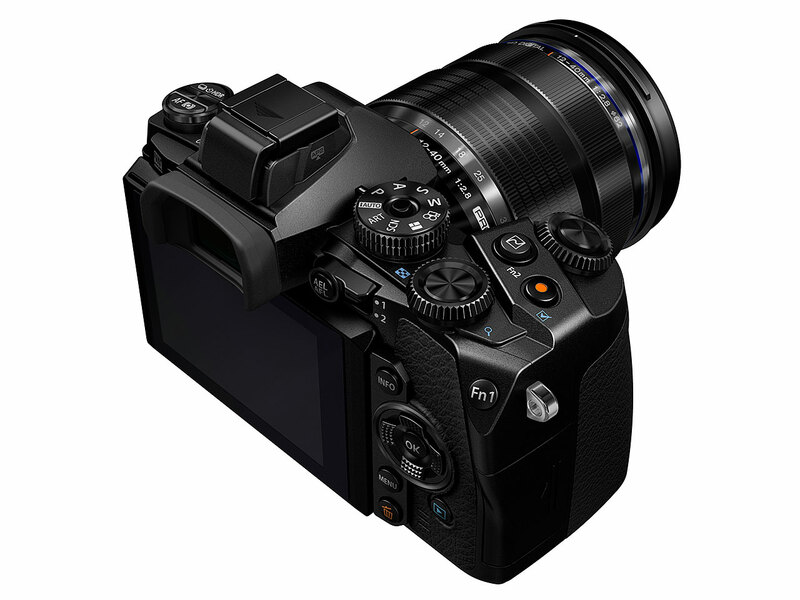 The Olympus E-M1 is equipped with two variations of HDR Shooting – HDR1 and HDR2. With a single press of the shutter button, four images with differing exposures are captured and automatically merged in the camera into a single HDR high-contrast image or super-high-contrast image. Photo Story mode enables users to capture a scene from multiple viewpoints and then combine the images into a single image to create unique collages inside the camera. Time Lapse Movie converts the series of pictures taken using interval shooting into a movie inside the camera. The Time Lapse Movie length has been increased to a maximum of 100 seconds. The number of possible shots that can be captured with Interval Shooting has been increased to 999. The E-M1 is also equipped with Focus Peaking, which dramatically improves the usability of older manual focus lenses. The M.ZUIKO Digital ED 12-40mm f2.8 PRO lens (24–80mm, 35mm equivalent) is the first model in the new M.ZUIKO PRO category and is scheduled for release at the same time as the Olympus OM-D E-M1. It features dustproof and waterproof performance, toughness and excellent image quality. Its mount employs the same type of sealing as the camera body and is Movie & Still Compatible (MSC) with high-speed, near-silent autofocus during still shooting and high-definition (HD) video capture. It maintains the brightness of a constant f2.8 aperture for high-grade image creation, one of the requirements of professional photographers for a high-performance lens. The M.ZUIKO Digital ED 40-150mm F2.8 PRO (80–300mm, 35mm equivalent) also joins the new M.ZUIKO PRO lens category. This lens is currently under development, with a planned release in the latter half of 2014. It will be a telephoto zoom lens with a bright constant f2.8 aperture and will feature a dustproof and splashproof construction rugged enough for professional use. Several new accessories are designed to complement the Olympus OM-D E-M1 and broaden the creative horizons of all advanced photographers. The HLD-7 Power Battery Holder is a dustproof and splashproof power battery holder that can enable the capture of approximately 680 shots (based on CIPA tests) between charges. It features a shutter button for shooting with the camera held vertically and two control dials and two function buttons for the same easy controls as when shooting from a horizontal position. The GS-5 Grip Strap for the HLD-7 keeps buttons and dials accessible even when the battery holder is attached. The PT-EP11 Underwater Case is made exclusively for the Olympus E-M1 and allows shooting down to 45 meters. The new CBG-10 Camera Bag is compact, yet designed with Four Thirds lens use in mind, and the highly water-resistant CS-42SF Soft Camera Case, which is part of the Camera Bag CBG-10 system, is made exclusively for use with the E-M1. The CSS-P118 Shoulder Strap is made of washable material with a slender width that matches the versatility of the Micro Four Thirds System. The Olympus OM-D E-M1 will be available in October 2013 in the following configurations. just wait three months, and you get this one for price of the current EP-5 at least. Hah, if any of you fools knew what is inside the E-M1 you would not be complaining. It's a bargain for 2500 Euros. There are no "bargains" in the Micro 4/3rds Panasonic-Olympus Duopoly World, unfortunately. In fact, next to medium format digital cameras, M4/3rd bodies and lenses must be the most expensive form factor cameras in the world right now. I mean, $1,400 for a M4/3 camera body? Plueeeese.... You pay more to get a smaller sensor inside vis-a-vis APS-C and full frame, or what? Olympus conversion rates continue to be of utmost bafflingness. 1400$ = 1500€ = 1300£? Even with taxes and such taken into the equation, this is just beyond ridiculous. I wonder what the Swiss price will be. Given their track record, it'll be 2000.- CHF, or more. Should I ever get one, I'm not getting it in Europe, that's dor sure. One of the big discounters has it on preorder for 1839.- CHF (1245£ or 1488€ or 1977$ US), body only, no MMF-3 or grip. Go figure. Missing in specs above is that this camera is only 12 bit not 14. At this price I would call that a deal breaker no matter who made the camera. Great job, Olympus! Thank you and Panasonic for delivering innovation. And you're delivering them in spades! No PDAF cross type sensors only vertical no horizontal , not a big deal but I thought they were calling this a pro grade camera. A used D600 costs 1500 ! Just interesting for people that have many m43 lenses already. Ultimately Oly will know if it is or not, the market will decide. I personally wouldn't shell out that much cash for a m4/3 camera, but that's just me. This camera is meant as a people pleaser. Those E5 customers who wanted a new E camera, the m4/3 shooters who wanted a top level m4/3 camera- its trying to please both (and others) all that the same time. I prefer a camera that doesn't try to please too many groups at once, rather, one that targets the biggest audience and is more specific to it. I think you get a more pure product that way. cgarrard, true to a certain degree, but you can also overspecialise. Making this camera appeal to both 4:3 customers as well as M43 should allow for more sales and a overall smaller price. yes 70D is over priced, too, and APS-C SLR isn't a good idea. mirrorless is. though m4/3" is not as good as it should be. would recommend D800 for 24MPix is too low resolution. Though I use FF myself, I see the E-M1 simply being another format instead of trying to see it as directly competing against the like of FF or APS-C.
For full setup, with the optional grip, and a fast zoom, yes its almost priced just as such, but I wager there is some form of alternatives instead. It will have to wait and see how the MMF-3+E-M1 work out. I really think Oly should have both the 12-40 and 40-150 both ready together. @yabokkie: You'd recommenced the D800 to everyone? For many, the D800 fails on size, price and weight. A definite "leave at home" camera. There are different markets. I'm starting to feel like Olympus is on track with this and the Pro lenses. Bravo. I invite DPR to look at the use of these comment pages in relation to the carpet bombing of negative posts from certain posters. If a poster has an adverse view of a camera that's fine - let it be said. However, once should be enough if you don't like it and you're not going to buy it. And if you're not, what is the ongoing purpose of being here and continuing to post multiple negative comments. This surely invites the reader to suspect that some of these posters are trolls at best and at worst, that it's a deliberate strategy to denigrate a product. FWIW, I'm not an Olympus user, have no plans to buy it, and read this page out of interest only. However the repeated criticism from posters known to have interests elsewhere is just plain obvious and hardly fair. I agree with Rod, but I guess there no way of stopping them, you just have to use your own common sense have your own mental "noise" filter. Haters are everywhere. you all stress yourself, and generally stress occurs if people and things around you do not behave the way you want them to do. Imagine, all of us had the same opinion, how boring it would be, both of you would sit there without knowing what to write about. It's for you as for all others, if it doesn't fits in your concept, ignore it. People will anyway always spend first all the time they have to find out what it does not has and where to put sh.. on it. But that's life, and life is a b.i.t.c.h., but someone has to live it on the end, isn't it. I would suggest you get a good cool beer first, after that, all looks different again, hahaha. Mayb it got even cheaper in the mean time, who knows? Been happening the last 12 months, also they have infested 43rumors, petapixel and some flickr groups.... Then they wonder why their traffic is down! You may have a point, but do note that Olympus cameras are not the only to experience this phenomenon. The Nikon V2 and Nikon 32 f/1.2 lens announcements, had page after page of the same negative comments. Same for the Canon SL1 announcement. I will also say that some m43 users, whether out of genuine excitement or something closer to reverse trolling, kind of invite users of other formats to post with overenthusiastic predictions about "this is definitely the nail in the mirrorbox coffin" and other similar nonsense. My god, this is so THICK and HEAVY when compared with the Nex6/7 !!! Yet it's so much smaller than a DSLR of comparable build quality. Thicker and heavier can be an asset and is, in the right hands. I don't get how one cannot look at both sides of a topic. Pros and cons to larger and heavier cameras and smaller and lighter ones equally. Use the tool best for the job you want it to do. Period. To continue my message below: you can also expect, if you buy this camera, that they will not have an API for developers to use the WiFi (like Sony does), nor any robust control interface with active software development behind it (like Canon does). They will not have any open-source firmware like Samsung does (so that when they cease development of the firmware in a year from now, you might actually be able to improve your camera if you know how to program). I really wish Oly would bring on someone to make sure their video features, user interface, and support for third-party developers was all greatly enhanced. I would gladly pay $200 higher for this camera if it had the additional features I lamented in my first post below. But now I have to buy a GH3 if I want decent video. It makes me sick. I agree. I would also prefer if Olympus (and other manufacturers like them) dared to open up their firmware somewhat to third party developers and "hackers".. I can see that they might have certain code and algorithms that they wouldn't want to share, and especially with wifi and net connectivity you would want some protection from malicious apps or hacks, but if that could be overcome it would be great to have a community working on improving and adding features to the cameras. Regarding video, I think it's probably "decent enough" for most with the 24 mbps 1080p30, but I'm disappointed too about the lack of 24/25 fps to reduce flicker from 50 Hz lighting, as well as the lack of the PDAF during video. The IBIS is such an enormous improvement for handheld video, that a few extra bells and whistles could have made it one of the absolute top cameras for video. No fully articulating screen, no headphones jack, no uncompressed HDMI out, no way to set the focus to infinity, no 4-way controller on the vertical grip, no 24P, no high-speed video modes (120FPS, 240FPS), and no touch-to-focus while recording video. Olympus is great at making products that are simultaneously must-haves, yet still, huge let-downs, full of "if only's" that leave loyal users such as myself feeling like citizens of a third-world country where you can only expect minimal things from the society despite it being a beautiful paradise in most regards. Here's what you can expect if you become an Olympus owner, even of their top-of-the-line products: they will only update the firmware to fix a major bug, but not to add any new features or functionality. If you email Olympus a suggestion for how to improve the firmware of your camera, they won't do it, but you'll see that improvement on the next camera they come out with. Buy a new one. Meanwhile Canon 7D is on firmware 2.x..
this is only a casual handy walk-around snap camera.
" Here's what you can expect if you become an Olympus owner, even of their top-of-the-line products: they will only update the firmware to fix a major bug, but not to add any new features or functionality. If you email Olympus a suggestion for how to improve the firmware of your camera, they won't do it, but you'll see that improvement on the next camera they come out with. Buy a new one... "
I have about 3-clip on Olympus flashes (multiple camera purchases) and an older EP-2 which has necessary port and connectivity ... alas ... can't do. The "milking" of customer base enforced by Olympus constant "buy-our-next" cycle ... seem to only benefit the company as for the most part is not offering anything more to the end user than minor operational fixes and ergonomic improvements. The truth to be said - EM1 is not "that much better" in picture quality department than their basic E-PM2 ... and hardly justifies 4-times the initial price. yabokkie: "this is only a casual handy walk-around snap camera." I would choose between GX-7 or some 99$ m43 body only deal for that usage. What is the difference between Four Thirds and Micro Four Thirds? Is the sensor size different? Four Thirds is a DSLR mount, Micro Four Thirds is a mount for Mirrorless camera, meaning it can offer a shorter flange-back distance (the gap between the mount and the sensor), because it doesn't need to leave room for a movable mirror. Both are based around 'Four Thirds' sensors (Usually 17.3 x 13mm, 4:3 aspect ratio). And with a shorter flange-back distance the lens can be smaller. But even 4/3rds is shorter mount than (many) APS-C sensor cameras. Thus, there are adapters from Nikon F, Olympus OM, M42, etc. to 4/3rds cameras. Yes. There are many enthusiasts who put all sorts of lenses on their m43 adapter. There is quite a market for secondhand lenses with all sorts of fittings. I've just dug out my old OM 50mm 1.4 lens which equates to 100mm. Great for portraits. Greed won over Olympus managers this time once again. They somehow decided that people bought E-M5 because it is Olympus and not because it was a better camera at cheaper price 19 months ago. After E-P5 pricing fiasco, now E-M1 pricing fiasco. There is a nice intereview in which the olympus rep says that they don't intend to make money on the cameras - they use it as a testing ground for their medical imaging technologies. So if you will, camera division is their pet project, like F-1 to Mercedes Benz. Perhaps they don't want to sell all that many of E-M1s. The price is always determined by what they think the market will pay. And it will drop over time to keep sales moving. Everyone camera maker does that. It would be foolish not to. With the M5 selling for $850 body only who is going to want to pay $1400 for the M 1 body only. Either the M5 or G7 are looking as a better deal to many people. It's not going to happen. 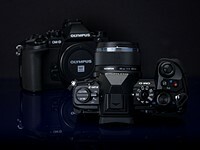 Olympus took a gamble by committing to Four Thirds years ago. And now with their entire lens line-up only covering the smaller image circle, and a lack of strong financial resources required to produce an entire new lens mount, it's unlikely that Olympus will go FF anytime soon, if ever. And would make Olympus NO money because you'd be using lenses they sold decades ago. I was slobbering over an OM-1 today in Oxfam. If only Olympus would make a digital version of that great camera without all the scene selection crud etc. they'd be onto a big seller. @groucher - you do know you can use a digital camera without using art modes, right? They don't make you use them. I think his point is that it clutters the menu system with distracting choices. If its not there, there is no distraction. I personally like the art filters but I do understand his point too. You don't even need to go into the menu to change the standard exposure controls. Just park the dial in M and pretend it is 1970.
where is the silver body? think the body should be made of gold. so expensive. With most Olympus lenses having silver barrels, you make an excellent point. marike6, almost all Olympus lenses have both silver and black versions. Or just black. I think the only "silver-only" is the old 17/2.8 nobody buys anymore anyway. DPR viewfinder size fiction continues. "Dividing (viewfinder magnification) by the crop factor" is essentially an assumption (in this case) that the MFT sensor is 1/2 the size of a FF sensor, which it is not. It is little more than 1/4 the size. So the new Oly's "wonder viewfinder is actually little more than 1/2 as big as a typical FF dSLR viewfinder. not interested in comparison of size of keyholes. would prefer retina display, 240 fps or more. maybe a future iPad minimi clipped on a rail or the lens. Just look through an VF-4 for instance. I have a 5Dmk2 and love the finder but the new VF-4 (and presumably the EM-1) is simply huge. I was always a hater of all sorts of non-OVF and thought I could never live without one but now this is changing. It started with my Fuji X100 and the hybrid VF which I think was a fantastic idea. Now that VFs get better and better with every increment, I believe that I won't miss my 5D any time soon. I never thought I would think this way. I feared the day when they would announce the last produced DSLR with OVF and I am sure this won't take more than a couple of years anymore. Today I am happy to see what is coming. A FF mirrorless with small lenses in a Pen-like design would be a killer. The only "rubbish" here is the ridiculous notion that "magnification" is a "linear" measurement. Based on your brilliant logic, a FF viewfinder with 70% magnification is less than half the size of the sensor. BS. The fallacy of DPR's calculations is readily evident; a 100% coverage, 100% magnification MFT/FT sensor, according to DPR calculations, would be roughly 1/2 the size of a 100%, 100% magnification FF sensor, which is actually is FOUR times the size (roughly). Believe any nonsense you like, but it's still BS. You really need to go back to physics and math classes. Magnification IS a linear property. 2x magnification means doubling the lenghts of the sides, which gives an image with four times as large area. So yes, the FF sensor is four times as large, in terms of area, but magnification is proportional to the square root of the area, or the image diagonal. No, it does NOT mean "doubling the lengths of the sides." Magnification is an expression of the apparent size of an object (as seen through an optical instrument) relative to the actual size of the object. "magnification — a measure of the ability of a lens or other optical instrument to magnify, EXPRESSED AS THE RATIO OF THE SIZE OF THE IMAGE TO THAT OF THE OBJECT." SO, A FF dSLR viewfinder with a "magnification" of 0.70x is 70% as big as the sensor. It is NOT 49% as big as the sensor, which it would be according to your ridiculous "physics and math." If the viewfinder WAS 49% of the size of the sensor, the "magnification" would be 0.49x! Viewfinder COVERAGE is SOMETIMES expressed as "linear" and sometimes as "area." Magnification, being an expression of relative size, is ALWAYS expressed as area, otherwise it wouldn't BE an expression of relative size at all. If anyone needs to go back to school, it is you. I don't know about the maths, but my E-M5 has a gorgeous viewfinder. Apparently the E-M1 is even better. Though I dont feel the need to upgrade. The E-M5 has it's faults. But I still love using it. I wish Olympus would put out aps-c cameras, or better yet FF. they sure know how to build nice cameras & lenses. It's too late now. They should have done that when they built the E1 (not the EM1). Digital is retracting, and the market is flooded with more cameras than ever. The novelty of digital also wearing off a bit which is adding to the retraction stew (economy, and other ingredients too). The chance is next to none that Oly would do something like that unless they could find a new niche. But build a whole new system of lenses and cameras, nope dot com. The results from m43 sensors are excellent. Better than many aps-c cameras. It is pointless for Olympus and Panasonic to make big bulky cameras as it would for Nikon to make a medium format camera. Pointless to make all the cameras the same. $1400?!! Wow. They're proud of that camera. Great camera! The only bummer is the video spec. No 24/25P? I think Oly leaves some money on the table here. I have to agree with this. Especially since the IBIS makes it a good candidate for handheld video. 30p only is not only a bummer, but a deal breaker for some. In this case, for a growing number of multimedia shooters the GH3 is looking more like the actual "pro" m43 body. 30p is perfectly useable on any computer screen and any tablet screen anywhere in the world, and on any TV screen in Japan (their primary market) and US, Canada and most of Latin America. And I bet it can be displayed on newer televisions in other countries too. 24 fps is too choppy (especially on your 60 fps LCD monitors), 60 fps @1080p cannot be displayed by most devices yet. Sure they should have provided 25 fps for some Europeans who want to watch the video on their old TVs, but it is a small market for them. The issue isn't really TV, but the underlying reason to the difference in the TV standards: The type of electrical power coming out of the wall. In most of the Americas and Japan they run with 60 Hz mains, and in most of the rest of the world they run with 50 Hz. This frequency can make your artificial lights flicker, and the easiest way to avoid it is to shoot with a shutter speed of 1/60 s when the power is 60 Hz and 1/50 s when the power is 50 Hz. But if you shoot with a 1/50 s shutter speed while you record 30p you risk getting smearing. it's interesting that Oly only get 30 fps while Pana can have 60 fps. then someone tell me that both of them use Sony sensor that can do 240 fps readout (AF pixels only). To avoid flicker, keep shutter speed close to your fps (i.e. shoot at 360 degrees or at least 180 if your system matches, not anything lower) with ND filters. Otherwise, because of the slight differences in frequency, you WILL have artifacts. None of them read out ALL pixels for video, they have to skip lines with that sensor. Probably Pana skips more lines at 60p, leading to lower real resolution and higher noise in low light. The readout of the full sensor at 60p would require 1.5GB/s of data processing, no camera has that yet AFAIK. I hope it's good, being the last one? of this is the pinnacle of Olympus evolution. I would have made the body a bit larger to better handle the 4/3rds lenses that this flagship model was "promised" to handle well. 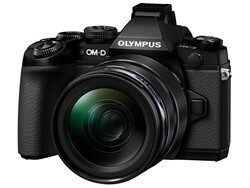 There obviously will not be any more OVF cameras from Olympus. Actually, I wonder where all this leaves Pentax-with 3 pretty conventional APS-C DSLRs, whilst Olympus, Panasonic, Fuji, Sony are doing some exciting things-refining micro 4/3rds or really offering variety in APS-C.
if you want a bigger body you can add the battery grip. The E-M1 is easy to hold with it's front grip. Nobody knows where the various formats are going. We'll have to wait and see. Even Nikons troubled 1 series might make a comeback. Ugghh - that faux pentaprism is so passe! Might make a good perch for a parrot. You think they could have housed the massive VF any other way? I like the look of it. Better than the square box style. The X-Pro1. is also big compared to the Olympus. The GX7 manages to squeeze anEVF in. But it is compromised compared to the Olympus. You mean, only 12 MP in proper 1:1 aspect ratio. What's this 3:2 nonsense? Err... what would be the MP for round exposure of 180 fisheye? ...yeah crappy camera indeed. What a lame complaint. Seriously. It's not like any regular display media are 3:2 anyway. 4x6, 8x12, 12x18, 16x24, 20x30, 24x36" are all 3:2 and pretty standard print sizes at any lab. Every picture needs whatever ratio that suits it best. Who wants an artificial constraint based on 35mm film when you want to be creative. Call one ratio "proper" looks more like wanting to follow rules rather than wanting freedom. "I will never change!" Sad. I'm all for honest and functional design, but there are two ways of designing something like a camera. Designing for how you think it should be used, or designing for how it is actually used. You may be able to change a few things here and there, but people are used to using cameras in a particular way, and they want to pick the camera up and shoot without having to check the manual for where the shutter button and viewfinder are. You don't need a manual to tell you where the viewfinder is - you can tell in a nanosecond just by looking. I agree with pancromat that Oly should think about moving the viewfinder further to the left, creating space for the shooter's nose. With DSLR there is no choice, because the mirror has to be in line with the lens, but an EVF can go anywhere. Sony's NEX 7 has the right kind of layout, I think, and it is also a very compact camera. The NEX is good. But not all cameras should be the same. Now we have a choice. The E-M5 retro look was very popular. Many other brands successfully use retro styling. It appears way too big with the built in grip. I went M43 because i wanted something smaller than my FF... with proportions like this it is approaching APS-C size (and smaller FF sizes). Why couldn't they keep the original OM-D E-M5's form factor? 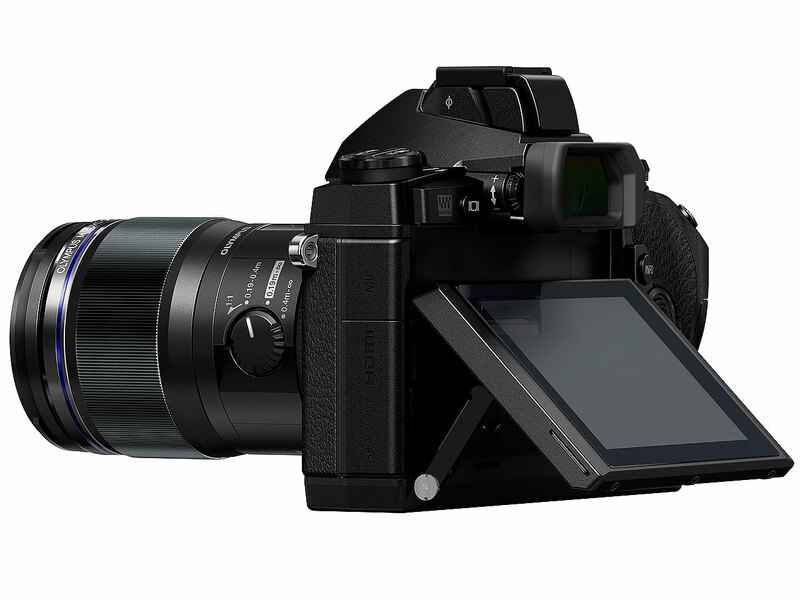 Just wait for the successor of the E-M5. I still don't feel like the design of the digital OMs is working. With a grip, the Evolts still look more balanced, and without a grip, which I think is the design that would live up better to the OM design, still show unbalanced design of the pentaprism-like top, and the general layout design of the top and (especially) the back look unattractive. They should try to get closer to the general proportions of the OM-1, that is, more rectangular body and less protruding pentaprism housing top. I have to admit that Oly resolved the problem of legacy/DSLR lens backward-compatibility in somewhat better fasion than Pentax did with his K-01. Ergonomics are included this time. Kind of, unfortunately it looks like it doesn't track as well as an E-5 with ZD lenses, which pretty much killed the reasons to want to use the 4/3 glass and left 4/3 users up a creek. Maybe it will improve with firmware updates. Way too much money for that tiny sensor. While it is an impressive piece of equipment, there are too many other options with larger sensors at this price point. With many more lenses to choose from with other systems. The price reflects the feature set rather than the sensor size. If it is out of your price range, there are plenty more affordable M43 cameras. Well, there is of course no accounting for taste, and every photographer has different needs and wants. Some will want a camera with the feature set of the E-M1, but for others it will be a massive overkill, and not worth the extra cost. The sensor isn't a big part of the final cost ( that's a big lie you've been fed for years). The E-M1 has a tonne of features and ease of use that those DSLRs don't have. How many lenses do you need to choose from? "The price reflects the feature set rather than the sensor size." What "feature set" over, say, Nikon D7100 or Canon 70D or Pentax K-5 II (or even Pentax k-30)? WiFi? ;) Art modes? :) :) Come on, without competitive performance and at higher price it will be another E-5 coming right after 7D. Weatherproofing and 5-axis image stabiliser spring to mind. Hmmm...if they keep making more and more awesome bodies and lenses like this, I may finally feel fine getting rid of my FF DSLR. I loved the image quality of the E-M5 I had, but I could never get used to that weird body. It just felt bad in my hands. I hope they addressed the squishy buttons in this new model too ;-) Next time around, I may not buy another SLR. I may very well be on my last SLR.....maybe. I had the same experience with the E-M5. I went in to a shop expecting to buy one and thoroughly disliked it from the moment I picked it up. Ergonomically, it was all wrong for me. This new camera looks much better ergonomically. I'm certainly goiing to check it out. At the moment I'm shooting with an E-P3 with the optional large grip. Only 6.5 fps with C-AF. EPIC FAIL (at this price, 7 fps 70D is $1200). They needed 9-10 fps with C-AF+Tracking to have the price they want. As it is, it is a $1000 camera, not $1400. Only an "epic fail" if burst rate is the only reason you choose a camera. I just looked up the 7D and saw it is 1499 MSRP, at 1339 now at Amazon. Cameras always come out a bit higher and lower quickly, probably as a marketing ploy. The prices are close to the same actually, with the EM1 having the same MSRP but being $60 more in the reduced price. After looking around, it seems the 7D's original MSRP was $1699. Apple to oranges, comparing launch price that will likely drop in a short while. You are an epic fail. "I just looked up the 7D and saw it is 1499 MSRP, at 1339 now at Amazon. " "Only an "epic fail" if burst rate is the only reason you choose a camera." Over other cameras which has everything else, only better? What else, brand name? I wonder who's going to break the m4/3 16MP barrier first... It seems a struggle every time a resolution upgrade is expected on (m)4/3 systems. Well... there's a reason they stay at 16. If you go higher, you get more noise, less dynamic range, and no appreciable increase in detail to compensate for the reduction in the other areas. 16 is already pushing it a bit. It would be just like all compact cameras today, which were ruined by the megapixel race and would have been so much better if they'd stayed below 6 megapixels. Considering that most people never enlarge their images beyond 2 megapixels anyway, neither for screen display or printing, that would have been a good thing. 16MP seems to be rather optimal value for this sensor size...For pixel density considered, m43 is already having tough diffraction limit issues. Putting more pixels on it would get you no extra detail even from the best lenses available. I guess someone, then, needs to inform Canon, Sony, and Nikon to stop increasing resolution and switch back to lower MP... But something tells me that it has been a good thing that Canon moved on from 12MP 5D to 22MP 5D III... It is one thing that m4/3 sensors are reaching their limit and another whether more resolution can be actually used to improve IQ and crop tolerance. The 4/3 initiative committee should have thought of the innate limitation of a smaller sensor. How do you know that if the 16mp barrier hasn't been broken by m4/3 yet? I doubt it, considering Sony sensors are on the case, I see a 20mp m4/3 sensor on the horizon. Next year. Mark my words :). Wow, Mr. RStyga, you must be a high-grade professional studio photographer if you really need more than 16mp. You must certainly be a better photographer than Joe Holmes, whose limited-edition 13 x 19" prints sell at Manhattan's Jen Bekman Gallery for $650 each. They were made on a 6mp D70. I do not subscribe to the masochist's show-off argument that a photographer needs to be struggling to get his/her camera to shoot what he/she aims for. It's nonsense. As for the art industry and how they ascribe value and -especially- prices on 'art', I could not care less. I've seen some more galleries filled with insults to photographic art than I can remember. The fact is that you can make enormous prints with a 16mp camera. The only people needing to print larger are professionals working on billboards. DPR: "Other interesting features include the E-M1's large electronic viewfinder, which has a magnification of 1.48X"
But in the spec table you have 1.3x. Also, you have put resolutions into "Videography notes", comparison tables don't look right because of it. I'll look into the videography notes thing. The EVF has several modes - some of which put a shooting data strip along the bottom, reducing the size available for the preview. The full figure is 1.48x, it's 1.3x if you devote some of the panel to shooting data. The E5 now has instant classic status with this announcement. Too bad they can't drop the internals of the EM1 into a refreshed E5 body so users have an even larger more spacious camera with an optical viewfinder alternative and of course, the improved sensor and real PDAF. It's a cool camera, but I think a real E5 successor with this sensor would still win over 4/3 shooters more than Oly may think. Sometimes it's just better to march on forward and not look back. Olympus might just be better off without the weight of 4/3. Not much weight to lug around when the $ in development of the system is already mostly spent... A larger camera like the E5 is what I've seen a lot of 4/3 users asking for for years now. It wouldn't take much more development cost to produce an E7 considering. But Oly made its choice. We'll see if its a good one or not in the long run. Perhaps their next move will be... I don't know. "A vocal minority of dinosaurs"
I remember being young and thinking I knew it all, and that older people were just in the way. At mid point, I've got a good indication now that kids are largely full of sh!t and older people do know a thing or two. This is my absolute dream camera. Combined with some SHG glass as well as some weather proofed compact zoom lenses, and nice primes too for traveling light. Yes, I know, I know, I have been an Oly fanboy since my 80's youth. I admit this! Was it only a few months ago that Olympus was saying they wouldn't be forgetting their loyal 4/3rds followers? Well, they haven't, unless you honestly believe that an EVF is a legitimate substitute for an optical slr viewfinder and with, hopefully, full compatibility for older 4/3rds lenses. The obvious problem here is no new lens designs for 4/3rds users who will be forced to move over to ILC to benefit. Does this new model herald the end of the road for 4/3rds slrs? Despite this slight gloom, I do believe it is uneconomic for Olympus to run two production lines for 4/3 and M4/3, and given that 4/3 never fully delivered on its promise and M4/3 is producing better IQ anyway, it seems a brave move for Olympus to finally concede the lack of viability and cost effectiveness in continuing with 4/3 which would be competing against more advanced APS-C contenders. To continue would only be money down the drain and which Olympus can little afford at present. Other positive aspect - since grip is already there, hasselblad cannot touch it! Well... if this had been a Sony, you'd probably still get a version with a near-extinct exotic hardwood grip and a snow leopard half-case for only a small premium of $3,000 more. I have an OMD 5, I have had it about a year now, ... It is superb! I bought it to take to places like Ho Chi Minh City in Vietnam where my Nikon gear stands out just a tad too much. I bought the Silver traditional look, again less conspicuous. Upon return I naturally gravitated to the Nikon with it's associated fast glass. The EM-1 has a Flash sync, .. Fantastic! Now it is in the pro class when it comes to functionality. The on/off switch now moved to the top plate; much better. Linholf "L" System, 4" x 5", ELM 500, Art Panorama, RB67, .. Now the OM-D has earned it's own space in my kit. I would not have believed it possible 5 years ago! should be careful not to build a system around the m4/3" mount. a "dumb still cute video" camera with a couple of lenses that are not too overly priced sounds good. there is no E-5 in it. there should not. some don't know how bad the SLR 4/3" is as a system. really bad. Olympus know it, only they didn't have the encurage to correct error. Panasonic offered them a better system, where Olympus is doing well. it's against everyone's interest to go back to the dark days. > some don't know how bad the SLR 4/3" is as a system. really bad. Olympus released some very well regarded lenses for 4/3 (like the 12-60mm and 14-35mm), the main mistake they made with the system IMHO was they concentrated on the pro market (with lots of expensive premium lenses) without sensors that could compete, and it's only really recently that 4/3rds sensors have become on-par with APS. And it's only one sensor that competes with APS. Still the best m4/3 sensor can't rival the best APS-C sensor, and never will. At least in terms of sheer performance. I'm evaluating an EP5 right now and I'm not all that impressed. Banding at higher ISO's isn't a good thing at all. One of the definite things to think about with EP5 is that you don't have to use high ISO as much with 5-axis IBIS. It's superb. I think I've only used ISO 2000 so far for real pictures. and that was a street at night lit by ambient street lights. This was the 20mm also, which is the lens known for the banding. Came out perfectly fine. Normally I stay at 1600 and below, and I think the banding issues happen around 6400. Possibly some at 3200, but I think it was 6400. Of course, IBIS doesn't work for stopping motion, but I still think with the 20mm 1.7 you wouldn't need above 3200 that much anyway. the name was Katsuhiro Takata. he was an optical guy but the SLR 4/3 was totally a crap from lens design point of view. Nice job Oly. This is how Canon should be innovating. the dual-pixel AF is a great invention of our times. only Canon is stuck in an old architecture for some reason we cannot understand. they should be able to do it but they chose not. maybe they are playing Nintendo to make good money with cheap components (I do think Nintendo is attractive with some tricks). Not a Canon user, but that is such rubbish. Canon has forgotten more camera and lens designs than most companies. You don't get to the top by not innovating. They have innovated. In 1987. > They have innovated. In 1987. They innovated when the created the 5D Mk II, the camera that started the whole HDSLR video revolution. They innovated when they created the EOS Cinema cameras. When they created the 200-400 f4 IS L with the built-in TC. When they created the 70D dual AF system. They innovated with they created one of the two most complete SLR systems in the world. Not a Canon fan, but it's time for reality check. What's so innovative about the E-M1? It's basically a larger, pricier EM-5 with a grip. I guess slowly but surely the end of the mirror box is coming. Dont get me wrong - i love my Canon 1DX, but i can't imagine SLRs getting better than that (FPS, AF sensor coverage, etc.). What do you think? Putting a little lipstick on an EM-5 and calling it the EM-1 is definitely not going to hasten the demise of ANY camera type, let alone the most popular that has ever existed. Mirrorless vendors need to figure out how to actually sell cameras first. yes, Canon is killing the mirror box with dual-pixel AF. > yes, Canon is killing the mirror box with dual-pixel AF. Except that they are not. The dual-pixel AF is for LiveView LCD use geared to videographers. You will likely not find a single Canon professional who wants Canon to remove the proper Pentaprism OVF in favor of an EVF. Not one. there is no technical reason to stay with SLR. there is no technical reason not to provide inferior products that the custmers want, either. I can't understand why they don't use a side-hinging monitor. It offers many more angles than a vertically hinging monitor (and no, i don't think of self-portraits). Some time ago, Panasonic and Olympus used side-hinging monitors, as they are best for composing a frame comfortably. I don't know, why both companies switched to vertically swinging ones. Only Canon, it seems, prefers side-hinging today. The main reason for using the tilt-only monitor, according to Olympus, is size - it allows a smaller, slimmer body. Panasonic offers fully-articulated LCDs on Micro Four Thirds SLR-style bodes, and they tend to be bigger than the OM-Ds. Even so, whether this is the best choice for the E-M1's target user is open to discussion. I'd prefer this one over more flexible side-hinging for most of time I only want to tilt it up and it's by far more efficient this way (would personally prefer a bottom-hinged one). fresh news. Who could have suspected? I like it, but ... 30 fps. Seriously? Olympus have been stuck on 30 fps since day one. What a wasted opportunity! Wouldn't that make it ±3? I counted it off on my fingers and you could be right. It would be the minimum to get a usable series for an HDR. Often the AE differences for HDRs are not strong enough. This being Olympus, AE bracketing and HDR bracketing are different modes, with HDR offering larger intervals. You can read about this in our E-P5 preview. Some happy Olympus fans today I bet. As an engineer that likes to tinker with things, they added almost everything that I would have wished for. In sensor phase detect for old 4/3rds lenses. GPS image tagging - through cell phone, which gets around the GPS battery hog problem by using the phone's battery. Remote control with image preview on a cell phone. Automated multi-shot HDR built in. One other wish that I've has for a while is open source firmware, but they put together such a well rounded product that I have almost run out of ideas for firmware modifications. Pretty much the only idea I have left is automated focus stacked macro. The lens looks nice, too. 12-60 would have been nice but after you factor in the laws of physics, this was probably the better compromise. This looks like the uncompromised upgrade to my E-510 that I have been waiting for. The price, well, if you compare the feature set to what else is on the marked, it is technically a good deal, but not one I can afford to jump on at this time. I love the idea of focus stacked macros! "The price, well, if you compare the feature set to what else is on the marked, it is technically a good deal,"
OK, compare it to 70D for $200 cheaper. D7100 for at least $250 cheaper. GH3 for $300 cheaper. A77 for $600 cheaper (or with 16-50/2.8 for just $100 more). Oly has definitely overpriced this one.